Is it time to impose a church dress code? nationwide are imposing dress codes — believing that it prompts students to take themselves and their studies more seriously. So, why not the same for church? Stage 1—Recruit code enforcement. The priests and deacons would recruit lay women of charitable but forceful demeanor, approximately two per Mass depending on the size of the parish, to enforce the dress code. These women would be trained to stand outside Mass and gently but firmly request those in violation of dress code to change. This stage would likely take eight weeks. I assure you, there would be no shortage of eager volunteers. Stage 2—Announce the coming change. Just as the Church has been doing with the coming liturgy changes, parishes would include a weekly insert into the bulletin explaining the simple, four-pronged dress code. Priests would alert parishioners at every Mass. (The media would help with its usual hit pieces.) This would be done for four weeks consecutively before dress code beings. Stage 3—Grace Period. 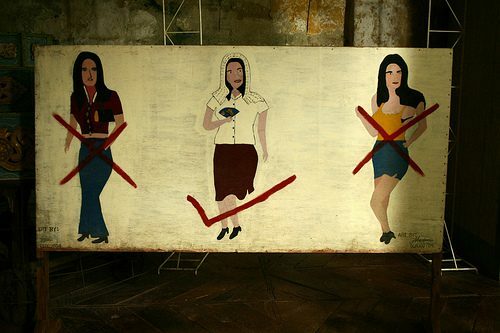 For two weeks there would be a grace period, where the newly trained women would give warnings to those not dressed appropriately that in the future, such attire will not be accepted, but still allow them into the House of God. This allows them to practice confronting those dressed inappropriately and allows the stubborn, skimpy dressers to avoid the humiliation of actually being sent home. When I was in Egypt, I visited a mosque dressed in what I thought was modest attire. The women at the entrance still took my pashmina from my bag and swaddled my arms so no skin above my elbows was exposed. I was swaddled so tightly I couldn’t move. Women and men whose attire was beyond salvageable were asked to wear a giant, floor-length green sheet with a hole through the top for their head. A Vatican insider told me that when a United States Supreme Court Justice showed up for a visit in shorts, he was turned away. On another occasion, a high-ranking woman showed up for an event with the pope in a low-cut top and Vatican officials sewed up her shirt in the car on the ride over. If St. Peter’s can turn away a Supreme Court justice and make a famous woman sew up her blouse for the Pope, then surely our local parishes can ask women to grab a shawl on their way out the door. Heck, put a basket of them inside the door and hand them out. Just like Jewish synagogues often have flimsy yarmulkes for men who show up with bare heads. People would freak out about the dress code. And then, suddenly, it would stop. People would move on. Girls would begrudgingly grab that shawl on the way out the door. Parents everywhere would breathe easily again knowing they won’t have to fight their children to dress appropriately for Sunday Mass. And then the House of God would actually start to look like the House of God again.